Anyway, lets talk about new resolution(s). I want to make few this year. First is to cook more for my family. I do not like cooking as much as Husband does (he's a better cook than me! ), so I will try to cook more whenever I can and have more food on the table. I think overall, this year I want to be better than last year in everything (in general!). As a God's servant, as a wife, as a mom and as a daughter. Insya Allah~ May this year will bring more opportunities and rezeki to us. Aamiin aamiinn.. 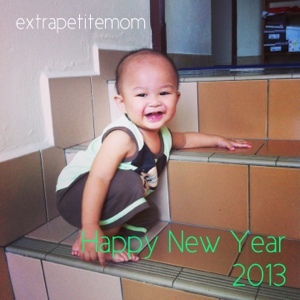 I love reading your blog and btw Happy 2013..
Hye there! Thank you for reading :) Happy 2013 to you too!